Sotheby’s December diamond auction & sale of Magnificent Jewels broke their previous record. The previous record was from 2010 when the auction house tallied an impressive $54,327,840, but this December they sold a magnificent $64,765,013. This success of this auction was largely contributed to by the sale of two beautiful collections– The Collection of Estee Lauder and Evelyn H. Lauder and the Wrightsman Collection. The Collection of Estee Lauder and Evelyn H. Lauder was sold to benefit the Breast Cancer Research Foundation®. The jewelry collection of Estee Lauder and Evelyn H. Lauder contributed an astonishing $22,248,250 of the day’s final sale total and contained an eclectic assortment of signed jewelry and fine diamonds. The top sale of the day was for a rare, 6.54 carat, internally flawless, fancy intense pink diamond ring that previously belonged to Evelyn H. Lauder. 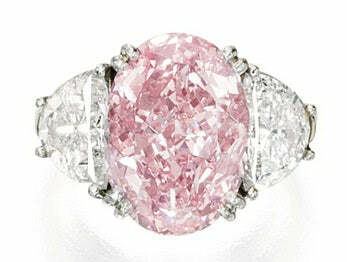 The piece sold for $8,594,500 ($1,313,144 per carat). Graff, a high-end London-based jeweler, was the winner of the ring after much competition from other bidders. The Wrightsman Collection also contributed quite well to the day’s earnings and accounted for $15,541,188 of the days total. The collection included many signed and designer pieces, including Suzanne Belperron, Verdura, Bulgari, Cartier and JAR.